Yesterday we posted a translation of this interview without realising that Euronews has posted an English version. It has also posted a version in Turkish and Arabic (but not a Hebrew one!) and several other languages. 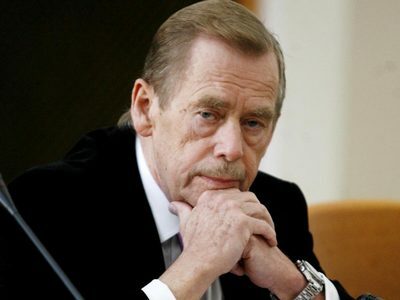 Consuelo Maldonado, Euronews: Gilles Devers, you are the spokesman for a group of lawyers who, in 2009, filed a complaint of war crimes against Israeli officers with the International Criminal Court. Since then, what progress has there been? Gilles Devers: The facts are established in the Goldstone Report. Everybody knows that warcrimes and crimes against humanity have been committed. While Palestine has the legal competence but has not exercised it because of the occupation, it can transfer this to the International Criminal Court. We are in a waiting phase which, unfortunately, corresponds with a double standard that has always been a mark of international law. But the crime is too big to be hidden. Euronews: You have been given a mandate by Gaza’s minister of justice to defend the rights of Palestinian prisoners. Are you looking at filing a new complaint with the international court? Devers: For the prisoners it is systematic torture, unfair judgements and conditions of detention – three chapters of violation of international law, therefore yes, the prisoners’ cases will be put before the International Criminal Court. Euronews: You are also investigating a case which in Gaza is called ‘the number cemeteries’. What is that about? Devers: Some detainees die in prison and Israel refuses to hand over their bodies, which is to say they make dead bodies serve sentences. Therefore, through the International Red Cross, we tell the families when someone has died, but the family does not have a death certificate, so they do not even know, are never sure if there has been a death, and the bodies are buried in numbered cemeteries. The person becomes a number and continues to serve out his sentence when he is dead. euronews: How many are we talking about? Devers: When we last visited Gaza, we worked with the authorities and found that 350 families were concerned. "A number of inmates die in prison and Israel refuses to return the bodies, i.e. Israel enforces sentences on corpses. So we notify the families through the Red Cross that they have died, but the family does not get a death certificate, and it cannot even be sure, it is never sure, whether death has occurred or not, and the bodies are buried in cemeteries which are numbered. The person becomes a number and continues to serve the sentence when dead." This is what Europeans listen to on Euronews (funded among others by the European Union), and other European news outlets about Israel. Gilles Devers is a French lawyer and is interviewed in French by Spanish-speaking journalist Consuelo Maldonado.The transcript has been translated with the help of Google. You can read the original and watch the video HERE. Bear in mind that Euronews offers "information from a European perspective". 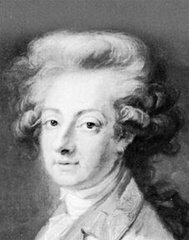 "Maître Gilles Devers, good evening. You are the spokesman for the group of lawyers who filed in January 2009, a complaint before the International Criminal Court for war crimes against Israeli officers. Since then, has there been progress?" "The facts were established by the Goldstone report, everyone knows that war crimes and crimes against humanity were committed. If Palestine has jurisdiction and cannot exercise it because of the occupation, it may transfer it to the International Criminal Court. Currently, we are in a waiting phase, which corresponds, unfortunately, to a double standard that marks the life of international law, but the crime is too big to be hidden." "You have been appointed by the Minister of Justice in Gaza to defend the rights of Palestinian prisoners. Are there any plan to file a new complaint with the ICC?" "For prisoners, it is the systematic torture, judgments that are not fair and also there are the conditions of detention, three chapters of international law violations. So yes, the files of prisoners will be filed with the International Criminal Court." Off-topic a bit again, I suggest that our readers have a look at a brief critique from Piety on Kierkegaard. The blogger rakes Ole Jørgensen over the coals for dragging out anti-Semitic stereotypes to defend Peter Tudvad’s book Stadier på antisemitismens vej: Søren Kierkegaard og Jøderne (Stages on the way of anti-Semitism: Søren Kierkegaard and the Jews). Jørgensen's article appeared in the Danish Kristeligt Dagblad (Christian Daily News). I think this gives you a little peek into how insular people can drag out Christ-killer accusations along with greedy-Jew characterizations, and then claim that these are simply factual depictions. Under this rubric, no one tarring Jews with these lies can be termed an anti-Semite. The blogger concludes that: "It makes the textbook example of 'For a fat girl, you don’t sweat much,' seem positively considerate!" ROME (AFP-EJP)---Police in Rome have arrested five Italian neo-fascists belonging to the "Militia" movement on harges of plotting violence against the Rome Jewish community. 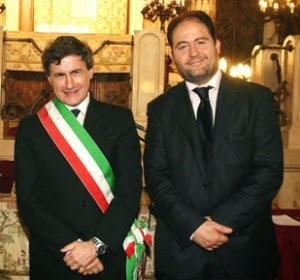 The accused plotted to attack Rome's Jewish community president, Riccardo Pacifici [right], as well as the city's mayor, Gianni Alemanno [left]; the president of the Chamber of Deputies, Gianfranco Fini; and the president of the Senate. All five are charged with having spread ideas based on ethnic and racial hatred by means of a bimonthly magazine called "Insurrection," as well as through offensive graffiti on the eternal city's ancient walls. Police said 11 others were under investigation. Those arrested Wednesday include the "Militia" longtime leader, Maurizio Boccaci, who is in his 50s. Police raids were carried out in several cities across the country. According to Italian state television, the accused wanted to foment a "revolutionary war" against the official Italian institutions. Alemanno and Fini both are mainstream right-wing politicians who had their political roots in the neo-fascist movement but now demonstrate strong support for Israel. Source: JPost Belgians Job Smeets and Nynke Tynagel plan to erect Holocaust-themed fence in Amsterdam. AMSTERDAM – Two famous designers from Antwerp have announced plans to erect a flashy, Holocaust-themed fence here featuring a crematoria and replicas from the Buchenwald concentration camp. Designers Job Smeets and Nynke Tynagel revealed the project after a Dutch museum rejected their “inappropriate” works on Auschwitz. The fence, which Smeets, 40, and Tynagel, 34, designed, had been commissioned by a Dutch art collector for the collector’s estate, Smeets said during a performance on a prime time Dutch television show on December 7. He said he would not reveal the collector’s identify. 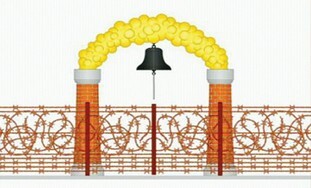 The fence design includes a translation of the German writing on the gates of Buchenwald – Jedem das Seine (“to each his own”). Smeets and Tynagel – described in a New York Times profile piece as “the poster boy and girl of the new expressionism in design” – designed for the same collector a dining set with a mass-grave motif. They also sent the Groninger Museum prints of tablecloths with an Auschwitz-Birkenau theme to be displayed along with other works by Smeets and Tynagel in the museum’s reception room. However, the museum – among Holland’s finest contemporary art museums – refused to show the tablecloths, which display an overview of the compound and a heap of reading glasses in the middle. Willemien Bouwer, a spokeswoman for the museum, said the hall is sometimes used to host parties and dinners. "The last thing that Israel needs is for the sanctimonious, hostile and (to a great extent) stupid European Parliament to stick its nose into the relationships between Jews and Arabs in Israel." Considering that the Far Right gaining strength and that neo-Nazi groups (like in Italy and Germany) have attacked and killed immigrants, as welle as the rise in anti-Semitism, it takes a lot of arrogance for Europeans to lecture Israel. Deborah Lipstadt said recently "that overall the situation in Europe was "not good" and added: "I wouldn’t want to send my kids to Jewish school in Belgium."" The European Union, as well as EU countries independently, provide millions of dollars annually to finance left-wing Israeli non-governmental organizations (NGOs) which could not survive on what they would get from the small number of Israelis that support them. These organizations use their resources to try to influence Israeli policies, laws, actions and even elections. They sponsor anti-government demonstrations, protests against the security fence, etc. In addition, they present highly distorted ‘data’ to the UN and to the media outside of Israel. For example, the majority of the material cited by the Goldstone Commission to support its false and libelous conclusion that Israel deliberately targeted Arab civilians in Gaza came from these NGOs. They have also participated in ‘lawfare’, instigating prosecutions in foreign countries of Israeli officials for ‘war crimes’ which did not occur, supported boycott-divestment-sanctions, encouraged anti-Zionist activities among Arab citizens of Israel, etc. These groups are in the forefront of the effort to delegitimize the Jewish state from without and destabilize it from within, and there is an ongoing debate in Israel’s Knesset about how to control, or at least expose, their foreign funding. An excellent summary of the issue is provided by NGO Monitor here. The European Union should consider Israel’s treatment of its Arab population a “core issue, not second tier to the Israeli-Palestinian conflict,” according to a classified working paper produced by European embassies in Israel, parts of which were obtained by Haaretz. This is an unprecedented document in that it deals with internal Israeli issues. According to European diplomats and senior Foreign Ministry officials, it was written and sent to EU headquarters in Brussels behind the back of the Israeli government. Other issues the document deals with include the lack of progress in the peace process, the continued occupation of the territories, Israel’s definition of itself as Jewish and democratic, and the influence of the Israeli Arab population. The original document also included suggestions for action the EU should take, but these were removed from the final version at the insistence of several countries. There is no internal issue more pressing for Israel than the relationship between the Jewish population and the 20% of Israeli citizens who are Arabs. Simplistic understandings of the admittedly difficult relationship as one of a powerful majority discriminating against a minority ignore the increasing perception of many Arabs that they are ‘Palestinians’, not Israelis (and the idea that ‘they are all disloyal’ is also simplistic and wrong). According to a European diplomat involved in drafting the report, work on it began more than a year ago at Britain's [!] initiative. 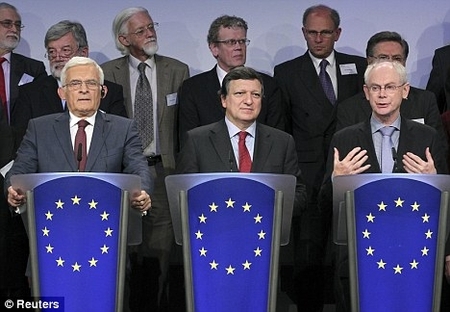 The idea was to write a report that could be debated by a forum of EU foreign ministers. At some point, however, several countries, among them the Czech Republic, Poland and the Netherlands, expressed objections to its contents. More evidence of the total lack of consideration European élites have for Jews and Israel. Considering how Europe treats their fellow Europeans, the Roma, and other minorities, European arrogance is amazing. The European Union should consider Israel's treatment of its Arab population a "core issue, not second tier to the Israeli-Palestinian conflict," according to a classified working paper produced by European embassies in Israel, parts of which were obtained by Haaretz. Other issues the document deals with include the lack of progress in the peace process, the continued occupation of the territories, Israel's definition of itself as Jewish and democratic, and the influence of the Israeli Arab population. The original document also included suggestions for action the EU should take, but these were removed from the final version at the insistence of several countries. 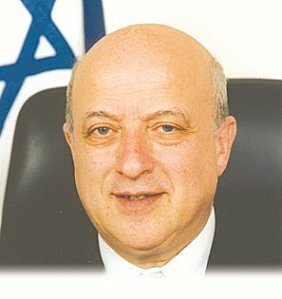 Among these were the suggestion that the EU file an official protest every time a bill discriminating against Arabs passes a second reading in the Knesset, and that the EU ensure that all Arab towns have completed urban plans, "with each member state potentially 'adopting' a municipality to this end." Two from Britain feature on their website : the Board of Deputies of British Jews and Academic Response to Antisemitism & Racism (ARAR). A little background on Mohammed Abdul Aziz, a founding member of ENAR, before Privot took over: "Mr Aziz has also been involved with the East London Mosque; the London Muslim Centre; the Muslim Council of Britain; the Commission for Racial Equality; the Equal Opportunities Commission; the Forum Against Islamophobia and Racism; the European Network Against Racism [you will find his name here on p. 3 last para. ]; and the UK Race and Europe Network. First, the advice Mr Aziz gives. The Daily Telegraph revealed this year that Mr Aziz had suggested that the new Government build closer ties with the controversial East London Mosque. He said that ministers should be willing to share a stage with groups that promote "a message of divisiveness, expressing intolerance towards other communities in the UK", and to treat privately with organisations that might support "violent extremism in Britain". Last night he apparently claimed that this was "completely untrue"." UK: Board of Deputies of British Jews and Academic Response to Antisemitism & Racism (ARAR). See: The Muslim Brotherhood in Belgium, a NEFA Foundation report (2008). Note disturbing links with Hamas. Did he apologize? Not really: "In the October 2011 issue of GQ, Von Trier is quoted in an interview saying he was not really sorry for the comments he made, only sorry he didn't make it clear that he was joking. He added, "I can't be sorry for what I said—it's against my nature." On October 5, 2011, Von Trier was interviewed by police in Denmark about his remarks at Cannes. Afterwards, he announced that he had 'decided from this day forth to refrain from all public statements and interviews'." BBC: Lars von Trier wins best movie at European film awards: Science fiction drama Melancholia, directed by Lars von Trier, was named best movie at this year's European Film Awards in Berlin. "Last year Canada stopped its core funding of roughly 10 million dollars annually for UNRWA. In 2011 UNRWA enjoyed a budget of 1.23 billion dollars, roughly half of it provided by the U.S and the European Commission – its two largest donors, followed by Sweden, Britain and Norway." THE HAGUE (EJP)---Holland will "thoroughly review" its policy on the United Nations Agency for Palestine Refugees in the Near East (UNWRA), Dutch Foreign Minister Uri Rosenthal [photo] told the parliament in The Hague. The Dutch ruling party called UNRWA’s definitions "worrisome." Holland is UNRWA’s 6th largest donor, with an annual contribution of roughly 30 million dollars. Rosenthal announced the review in reply to a question by the speaker of his own faction, the Liberal VVD. "UNRWA uses its own unique definition of refugees, different to the UN’s. The refugee issue is a big obstacle for peace. We therefore ask the government acknowledge this discrepancy, which leads to the third-generation Palestinian refugees," VVD speaker Hans Ten Broeke said. Minister Uri Rosenthal promised to "thoroughly review the subject and adopt a balanced resolution on it." He added: "I understand many involved parties regard UNRWA’s approach as highly important as it helps clarify matters and bring them into focus." The minister’s position is expected to be submitted in the coming weeks in a letter to parliament. UNRWA was set up in 1949 by the UN High Commissioner for Refugees (UNHCR) as an independent body entrusted with caring for Palestinian refugees who fled their homes in the years 1946-1949. Unlike UNHCR, UNRWA extends the definition of refugee also to descendants. Additionally, UNRWA refugees keep their status after gaining citizenship. UNHCR is responsible for all refugees except Palestinians. According to UNRWA, there are approximately five million Palestinian refugees worldwide. Last year Canada stopped its core funding of roughly 10 million dollars annually for UNRWA. In 2011 UNRWA enjoyed a budget of 1.23 billion dollars, roughly half of it provided by the U.S and the European Commission – its two largest donors, followed by Sweden, Britain and Norway. At least 64 jounalists are in jail in Turkey and 42 en Iran. 42 journalists were killed in 2011 (none in Israel). But by cleverly using a photo the Committee to Protect Journalists (CPJ) points the finger at Israel! The CPJ is "A group of U.S. foreign correspondents created CPJ in response to the often brutal treatment of their foreign colleagues by authoritarian governments and other enemies of independent journalism." 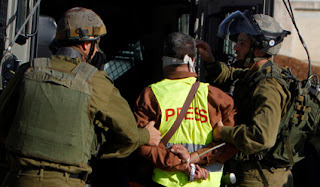 The CPJ is suggesting that Israelly prisons are full of journalists, is that the case? No. The CPJ, does not say that in the Palestinian territories under the PA and in Gaza, journalists can work without fearing censorship and being jailed. But there is more. The way the CPJ lists the journalists imprisoned in Israel in 2011 is a model of misinformation: "Israel and the Occupied Palestinian Territory: 7". The last three on the list (Ziyad Awad, Mahmoud al-Barbar and Hani al-Agha) are Hamas prisoners. 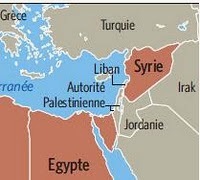 It follows that for the CPJ the Gaza strip seems to be Israel and Hamas an Israeli organisation. This type of biaised reporting is the best way to discredit journalists and journalism. To get a better view of how journalists are both treated in Gaza and in the West Bank read Khaled Abu Toameh's US and EU Funding Palestinian Repression and PA Tortures Journalists. Issa Qaraqe came to Brussels with a nine other people and was also received by the Belgian parliament. He told Belgian newspaper Le Soir: "At least people listen to me here in Brussels. European parliamentarians, European Commission senior officials, Catherine Ashton cabinet, the two chambers of the Belgian Parliament and several organisations have received me and listened to me. My message is to plead with them to put pressure on Israel - and if needs be to reconsider the association agreements that include a clause on human rights - to make this State [of Israel] respects the rights of prisoners on the one hand (those Gaza have no right to family visits, for example) and their release of the other. Israel considers itself above international law and this is everybody's concern". As to Gilad Shalit's release the minister, who spent ten years in detention in Israel, claimed that it sent the wrong signal that the only way to free Palestinian prisoners requires the kidnapping of Israeli soldiers. BRUSSELS, December 6, 2011 (WAFA) - Minister of Detainees and Ex-Detainees, Issa Qaraqe, Tuesday called on the European parliament to send a fact-finding committee to investigate Palestinian prisoners’ conditions and suffering in Israeli jails. In a meeting in Brussels with Vice-Chairman of the Foreign Affairs Committee of the European Parliament, Tokia Saïfi [a former French Minister in Jacques Chirac's government], Qaraqe gave a detailed description of the difficult situation prisoners face in Israeli jails, which violates all international laws and humanitarian values. He added that Israel does not care for any criticism regarding its violent and inhumane measures against prisoners, including 23 members of the Palestinian parliament, who are also considered international parliamentarians and cannot be detained under any justification. Qaraqa said there is an unjustified delay by the European parliament in taking the required decisions to insure the protection of prisoners. He stressed the need for the European parliament to support the Palestinian bid to the United Nations in order to determine the legal status of prisoners, and to be able to protect them in accordance with the relevant laws. On her part, Saifi said she will support the request to send a fact-finding committee to the Israeli prisons as soon as possible, stressing the need to get all the information for the parliament in dealing with the prisoners’ issue. The Minister of Government administration, reform and church affairs, Rigmor Aasrud, is to visit Jerusalem. She will speak to religious leaders on Israeli and Palestinian side, and visit religious sites. Among her visits, one will be a visit to the Augusta Victoria church [German Hospital and church ("Evangelical Lutheran Church of the Ascension") on the north side of Mount of Olives]in Jerusalem, to see an exhibit by Norwegian artist Håkon Gullvåg; which will open on December the 16th. The exhibition is sponsored by the Norwegian Ministry of Government Administration, Reform and Church, The Country Municipality of Sør- Trøndelag (the first and only county council that adopted a boycott Israel motion), the Municipality of Trondheim, (which regularly sponsors pro-Arab, anti-Israel art), Fagforbundet i Trondheim, the local union chapter that asked The Norwegian Confederation of Trade Unions (LO) in Trondheim to convert the Mai 1 Labour Day parade into a Pro-Palestinian event. The fourth sponsor is a commercial bank who to my knowledge maintains impeccable neutrality to preserve its commercial reputation. However, three out of 4 sponsors are rabid anti-Israeli’s all coming form what now appears to be the hub of anti-Israel political initiatives in Norway, with the NTNU being their standard bearer. Mr. Gullvåg is the artist who got the hump when the French Cultural Center in Damascus took down some of his paintings exhibited for the Terra Sancta exhibition. 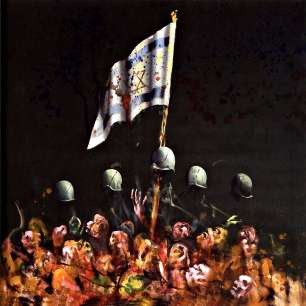 Censure, he furiously claimed, until confronted with the reality that his blood tainted pictures were not deemed sufficiently anti-Israel by the Damascus art lovers. 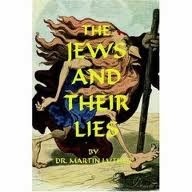 "'We are often asked why the Jews have been being hated so much and for so long. The question has to be made to those who hate us, not to those who are hated.' This thought by Isaac Querub Caro, president of the Federación de Comunidades Judías de España (F.C.J.E. [in English, Federation of Jewish Communities of Spain]), summarized the IV International Seminar on Anti-Semitism. It was closed the last night at the Fundación Caja Navarra [Caja Navarra Foundation]. Several graffiti in the street insulted those present with phrases such as 'Zionism is terrorism' and red crossing-outs on the Star of David. 'The insults, the graffiti, and the slogans against the Jews are considered something normal, when the truth is that they reflect an underlying anti-Semitism. They're a symptom of a social pathology', Alejandro Baer, professor of Sociology at the University of Munich, had denounced previously. Jurist Jorge Trías Sagnier, who participated in the debate Penal struggle against anti-Semitism and hate offences, expressed his repugnance regarding last April [Spanish] Supreme Court sentence which revoked the conviction against four nazis when considering that phrases such as: 'The Jews are destroyers and promote the wars'; 'The Germans were wrong for not having burnt all of them'; or that 'They're a pestilent race', don't pose a danger and don't deserve a penal reproach. Trías Sagnier described that sentence as 'barbaric'. 'Some of the magistrates who passed it are the same who are chasing Baltasar Garzón [a Spanish magistrate currently under a judicial investigation for his alleged missconduct during his own judicial investigation on the crimes committed by former Spanish dictator Francisco Franco], but there was a particular vote, full of dignity, by magistrate Martínez Arrieta', he added. Jews are just a o.1% of Spain's population, but the anti-Semitism levels are among the highest ones in Europe, Querub denounced. The final manifesto of the seminar concluded that 'the denial of the existence of this anti-Semitism aggravates the problem and stops its prevention'."